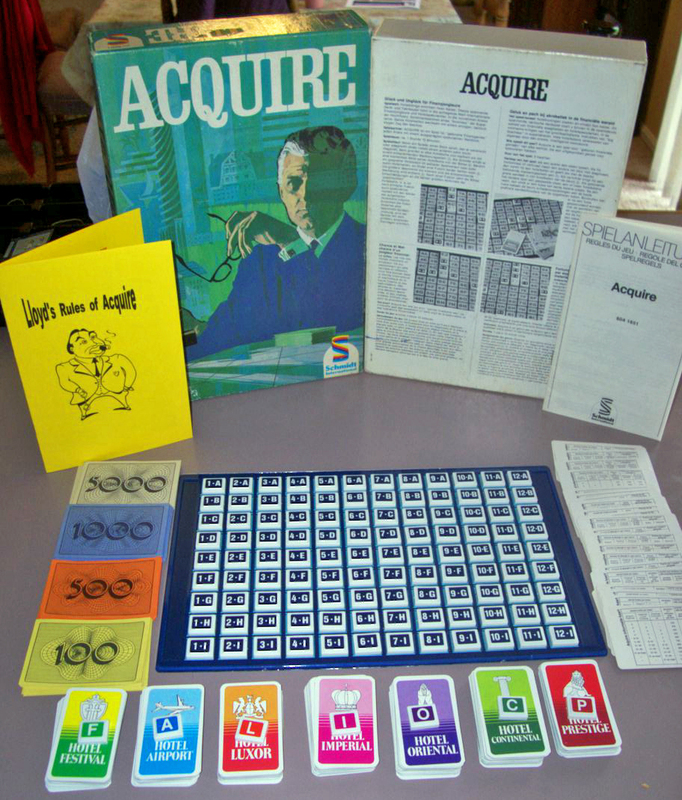 3M produced a German version of ACQUIRE in 1968. It looked a lot like the 1968/71 editions produced in the U.S. with some slight variances. The box was done with a thicker cardboard and has a very different texture than the editions released in the U.S. There is also a rule booklet instead of the rules being printed on the inside of the top of the inner box which provides more information. All the writing is in German on the box, the rule booklet, and the information cards. The stock certificates have a rich look to them since the color of the stock certificate transcends the entire card. The U.S. editions had a white border around the edge. The stocks also say “Aktie” at the top which must refer to “Stock Certificate” in German since that is what is on the U.S. editions. The money uses a color scheme that is not used on any other edition of ACQUIRE with the $5,000 bills in navy blue, the $1,000 bills in green, $500 bills in red, and the $100 bills in yellow. It would appear that 3M passed the production of ACQUIRE in Germany off to the Schmidt Spiele Company after this edition. 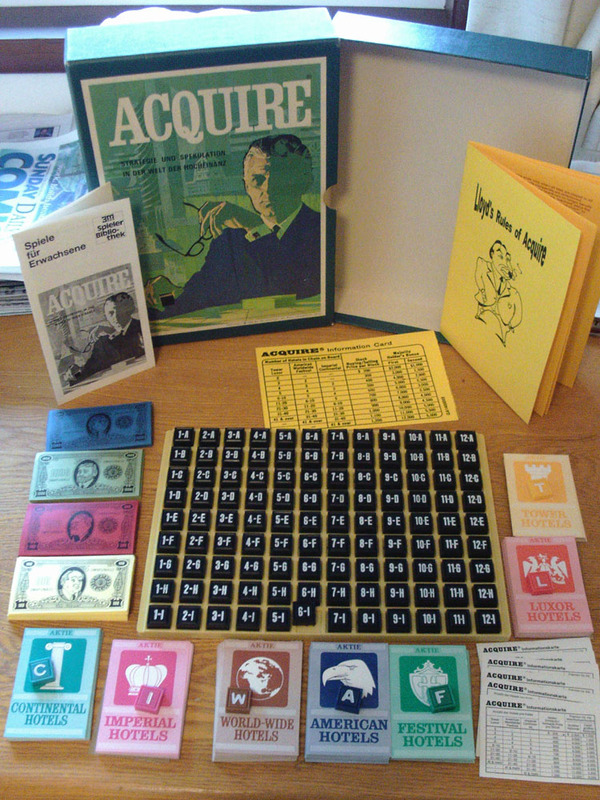 Schmidt Spiele of Germany has produced at least four versions of the game of ACQUIRE. The first edition resembled the Green Box Edition from 1968/71. Since the German games do not include copyright dates, it is assumed that these editions were made sometime around 1971, which is the year the Green Box Edition was produced in the U.S. 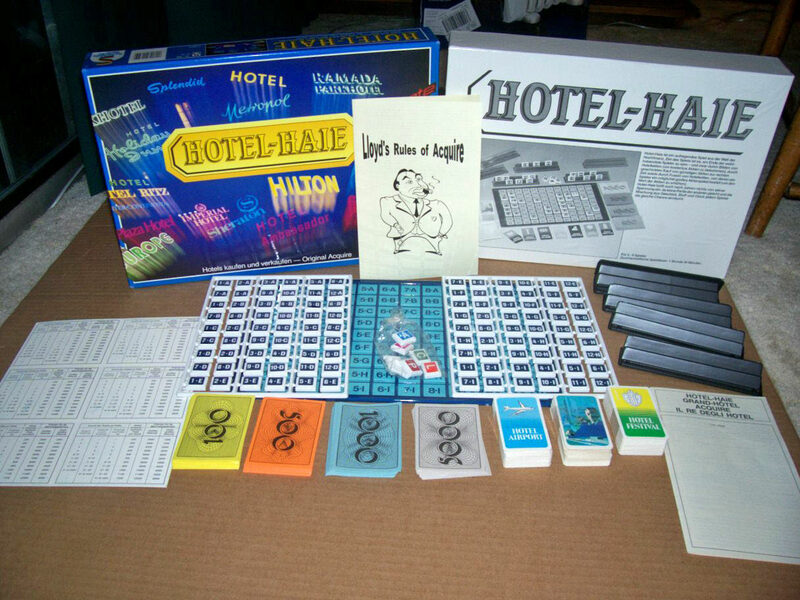 The board in this edition was two inches wider than the American editions and the tiles had a tiered effect for easier handling. This design had a far better visual appeal and the tiles were easier to read than what was being offered in the U.S. The stock certificates were considerably smaller than the American versions, but were printed on the back with the outer box artwork. The Germans made Festival and Airport as the low-priced hotels. Luxor, Oriental and Imperial are medium-priced, and Prestige and Continental are high-priced. There are 24 Information Cards in four different languages. (English is not one of them.) The rules are also printed in the four different languages. Tiles are too thin to stand on their own and must be laid face down in front of player. 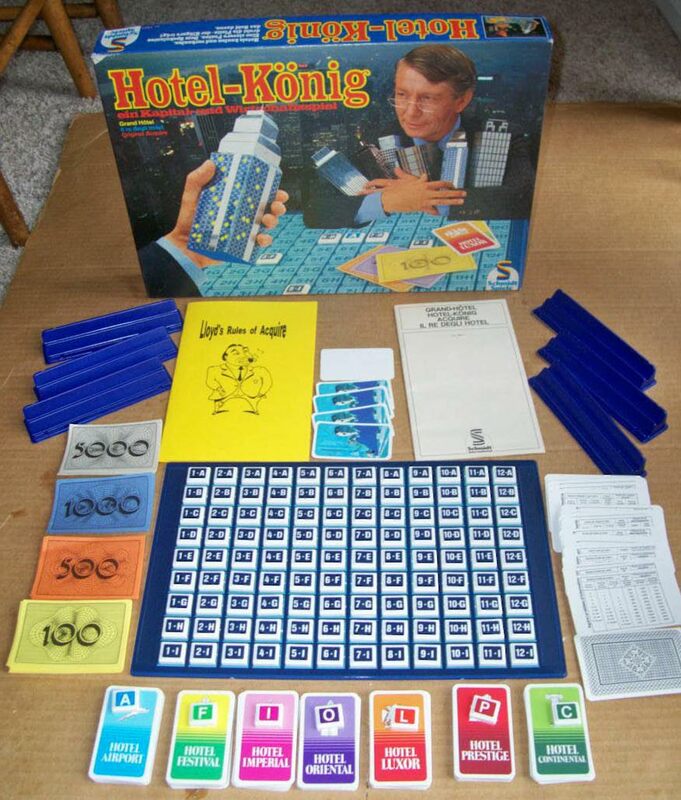 Schmidt Spiele produced Hotel Konig sometime in the 1970's and then Hotel Haie in the 1980's. The contents of these games were mirror images of the German Green Box edition, but with different box artwork. Larger boxes were used to provide tile holders for easier viewing of tiles during game play. These editions also offered blank stock certificates to use as replacements for lost stock. All three of these editions are very well-crafted and are also difficult to obtain in the United States. 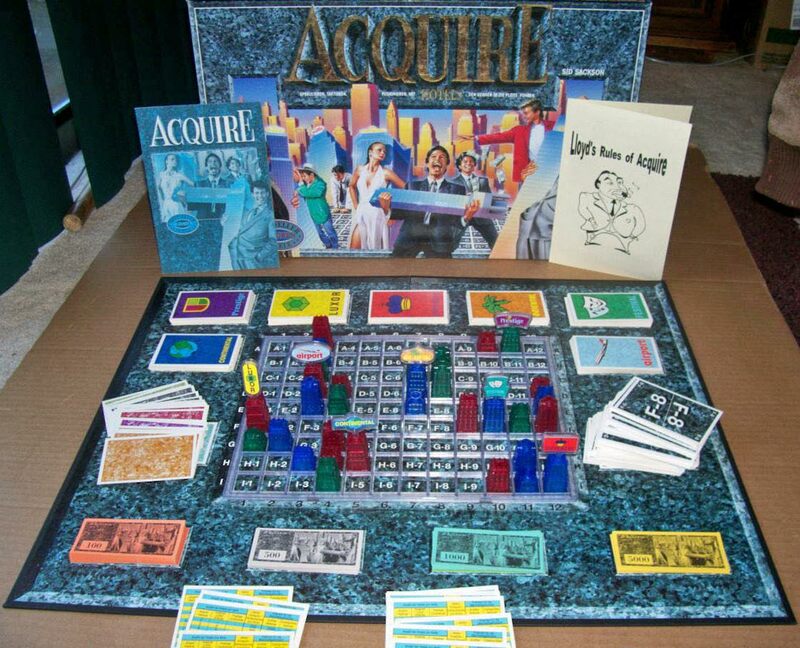 In 1993, Schmidt Spiele produced the most elegant version of ACQUIRE. The tile designations were flipped as in the original World Map Edition (A-1 instead of 1-A). Three-dimensional buildings were used instead of tiles and the players held a hand of cards instead of tiles. The player plays the card with the tile designation and then they select a building from the box and place it in the square. The board is cardboard with a plastic grid that snaps into place to hold the buildings. There are designated places on the board for all game components. Hotel markers are made to fit in the top of the buildings to create a billboard. This edition introduced the Special Powers Variants. The only two draw-backs in this edition are that the buildings begin to obscure the visibility of the open squares during game play and the rules and Special Powers Variant cards are unavailable in English. It has the biggest box of any ACQUIRE editions.